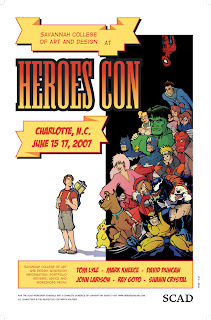 gobnobble -- the comic work of David Allan Duncan: Heroes Con this Weekend! I'm super busy getting ready for Heroes Con this weekend. I'm nervous about this workshop because I don't know how many people will show up or what sort of people will care to hear me speak. 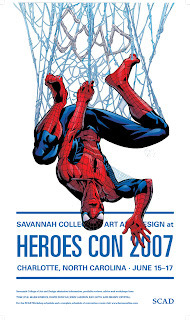 If you are around Charlotte for the Con you should come by and see the SCAD table or even drop in on the Workshops. 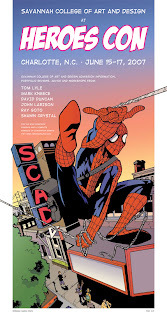 If you've already had any of these teachers before, I doubt any of the teachers will be covering anything in 1.5 hours that wasn't covered in the 50 hour SCAD course. The second poster here is drawn by Josh Dunbar, inked by Tom Lyle. Finally this one is drawn by Ted "the fancy cook" Helard, inks by Lowe again. They all look really good, don't they? I'm looking forward to this weekend!